They say in sailing that a captain goes down with his ship. Well, in the band world we say, the director is the last one on the bus, or in other cases, the last one to seek shelter during a storm. I remember during my days marching that our director climbed the side of a light pole into a metal scaffold to watch our formations and of course take a lightning strike for us. Okay okay, maybe we don't say that exactly, but it is true that our Directors make sure that student's safety comes first sometimes putting themselves in harms way. 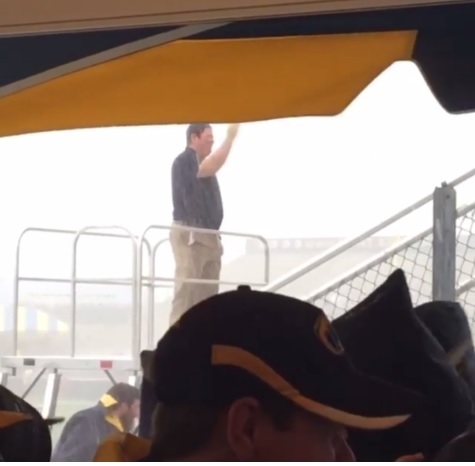 At Kent State this past weekend, a storm rolled into town bringing a major downpour that hit during the game. As the band tried to get to cover, the football team scored and like they would during a sunny game, the remaining students played the fight song. The best part was the commitment of their Director John Franklin to stay on the ladder while getting pelted with rain without a rain coat. Now that is dedication to the craft, the team and the students! Well done. Please someone get this man a towel!